The purpose of this study is to examine the factors to determine the competence of technology integration for teacher candidates. This study utilized data from a 2006 quick-response survey entitled ‘Educational Technology in Teacher Education Programs for Initial Licensure.’ Only 1,350 institutions that have teacher education programs for initial licensure were selected. The result of a hierarchical regression revealed that the extent of institutional training programs for technology explain most variation (33%) of the competence of technology integration of teacher candidates. In addition, the more variation of technology programs an institution employs in its program, the more confidence the teacher candidates possess. The result supports findings from previous research as well as supporting some emphasis on professional development design considerations that may be of value to those planning the similar technology trainings. During the past two decades, integration in educational technology has been a leading theme in the area of pre-service teacher education in the United States. There are two major issues associated with the importance of educational technology integration. The first is the accountability movement in the United States which emphasizes student academic achievement. Although contradictory findings on the effectiveness of educational technology exist (Kay, 2006), there is an agreement that the use of educational technology can improve student academic achievement, if it is implemented properly (Protheroe, 2005). The second is an emphasis on educational accountability by the No Child Left Behind (NCLB) Act of 2001. Recently, some researchers have asserted that educational technology may be the remedy to narrowing the achievement gap between majority and minority students. Several researchers (Ba, Tally, & Tsikalas, 2002; Du et al., 2004; Jackson et al., 2005) have stated that technology has a greater impact on academic achievement for the socioeconomically disadvantaged students than others. In addition, Park (2008) has recently determined that the positive impact of computer usage on academic achievement is greater for language minority students than for English-speaking students. Based on recent findings associated with the impact of technology on socioeconomically disadvantaged and language minority students, educators may support the claim that the technology revolution is now one of the most effective and significant resolutions in educational policies. Due to the collaborative effort of educational policy makers and administrators, computer availability and accessibility in schools have improved. Although the use of instructional technology has become increasingly important in schools, the growth in instructional technology integration has not kept pace with teacher preparation. Relatively few teachers feel that they are prepared. Ineffective teacher education programs are often cited as the reason for this problem (Brinkerhoff, 2006; Fleming, Motamedi, & May, 2007). According to NCES report (2000), only one-third of elementary teachers in the United States felt that they were well prepared for instructional technology teaching. In addition, this report revealed that teachers with less experience in teaching were better prepared and more likely to use computers in the classroom over those who have more experience. One explanation is that a vast majority of today’s classroom teachers are digital immigrants (Prensky, 2001). Simply put, the technology tools that are available today have been developed and implemented during the last decade. Digital immigrants have to learn how to integrate them into their pedagogy and instructional delivery system. Digital natives are students who have grown up with technology. They process information in a way that does not fit to the traditional model of learning. Digital immigrants have to “learn” how to use technology, not only in their personal lives, but also in their instructional practices. Therefore, it may be inferred that the enhancement of technology education in teacher education programs is the key to improve educational technology’s impact on student achievement. Educators in teacher education programs face a strong challenge in preparing teacher candidates to integrate technology into curriculum and instruction. 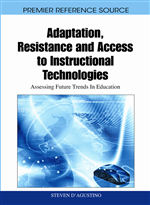 Several researchers (e.g., ChanLin, 2005; Franklin, 2008; Hanks, 2002) have tried to determine the factors that prevent implementation of technology integration among teachers. Hanks (2002) found environmental and personal factors effecting teacher’s utilization of technology. ChanLin (2005) revealed five factors; social impact, curriculum concerns, environmental support, interest and experience, and personal need. Franklin (2008) also discussed availability and access to technology, teacher preparation and training, leadership, and time as the main factors in technology integration. In addition to these factors, some researchers took a different path to conduct their studies and examined negative factors, specifically, barriers that prevent or restrict teachers’ integration of technology. Brinkerhoff (2006) grouped a variety of barriers into four categories: resources, institutional and administrative support, training and experience, and attitudinal or personality factors. Although accessibility to resources as a barrier had been gradually overcome, other barriers still remain (Schoepp, 2004).